Almost any kind of business needs to promote itself online to become successful or grow. Online marketing can also help you a lot, if you are a personal trainer and want more clients online. You can even learn this no matter your previous technical skills. 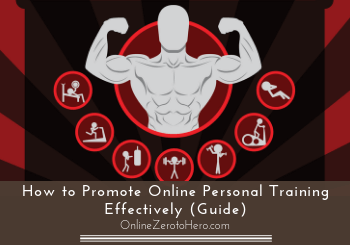 In this article I will show you the basics of how to promote online personal training effectively. It will give you a good foundation, a way to start, and more resources to go even deeper and scale your business further. Let me first start by saying that I am not myself a personal trainer anymore – I have worked in gyms and as a martial arts instructor for many years in the past, so I have a good understanding of this business. But this is not the main reason I can share some helpful tips in this article. I have worked with online marketing for years, and I have a lot of experience in promoting online. The principles used are the same for any kind of business and too many personal trainers are not aware of these, so in this article I will give you the foundation to grow your business by using online media. Here I do not mean that you need some kind of special discount. That can be great at times, but this is not my point here. You first of all need to know what you are offering people/your audience, and why it is valuable to them. Are you for example offering personal training face-to-face and want to promote this online to get more clients, or are you offering online personal training sessions and courses, or maybe both or something third. So before starting to promote yourself, you of course need to be aware of what you are offering, but also how this makes a difference for your potential clients. This can change at times, and often it will develops over time, but you need a good understanding of the direction you want to take it in before starting to promote, as this will make it more effective. To promote your personal training offers online, you need some kind of platform. There are A LOT of platforms you can choose from, and which ones are the best for you depends a lot on your personal preferences. Some people prefer InstaGram, Facebook, Twitter, Pinterest, YouTube, having a website, etc. All of these are great ways to promote yourself and online training. However, first I would encourage you to only select 1-2 platforms. Often people think they have to be on all social networks, and then end up delivering poor content for many of them. It is better to focus on 1-2 and master these before expanding to others. No matter what, I would however suggest building your own personal training website. This is not an absolute must, but it is my top recommendation for building a long-term online source of clients. I will show you why later. If you want to know how to build a personal training website, I will show you later how you can learn this no matter your technical skills. You can of course hire someone to do it, but in many cases this will not be necessary and it will often even give better results, if you do it yourself. You can actually even start building a WordPress website for free, if you just want to test it out. But if your are serious about your website and business, it is a good idea to invest the small fee for a brandable website name and address at some point. Once you are clear about what kind of personal training you will offer, and when you have decided which platforms to use for a start, then you can start taking the first promotional steps. It is important to understand that whether you promote online personal training, face-to-face training, or something else, online marketing is a process. You can get quick results, if you have a budget. But if you want to build a sustainable brand and maybe even do it without having to spend a lot of money on advertising, it is a process and it accumulates over time. With patience, it can give amazing results, so do not just treat it as a quick fix. It can be quick, if you have the budget and want to do paid advertisements. Here I however want to focus on how you can build a long-term flow of new personal training clients for free. My top recommendation is as mentioned earlier to first of all develop a website. This can then definitely be combined with social media which is great for personal trainers. You probably know from yourself that whenever you need something, you often start by searching on the internet. This also goes for people looking for a personal trainer whether it is a local personal trainer they are looking for or online personal training courses. Being present and being able to be found when people search online is an amazing long-term way to get traffic and clients. To make this work, you need a website, and you need to do basic SEO when creating the site. This might sound scary at first, but it really does not have to be. And you can learn to do this no matter your previous skills. By getting involved in the process and taking care of it yourself instead of just hiring someone, it becomes a lot more personal and clients can sense this, and it can increase you chances of getting clients a lot in my experience. When you have a website, and use it to tell about your approach to training, give advice, etc. it tells people a lot about who you are and what you offer, at the moment when they are actively looking for answers and services. This helps to brand, it creates trust, and people are more likely to then contact you to get an offer and buy your services. An important aspect of branding is in my experience the content you put on your website. This is also very closely related to the next point which is the continuous flow of traffic. If you build a website with a lot of great content, it is not only an amazing way to brand yourself and create trust. It is also the best way to create a continuous flow of traffic, which leads to more clients. That is why blogging is a great way to promote your business. Blogging might sound scary and weird, if you have never done it before. But simply put it is just you sharing your ideas and experiences with others about topics that they are looking for information about. When it comes to personal training there are A LOT of people looking for A LOT of information online every day, so there are plenty of topics to write about. I have personal experienced what it can do for a website, for the traffic, and for the income, if you continuously use it to blog and share your experiences and to help others. It can give amazing results, and that is why this is my top recommendation to use, if you want to promote a personal training business online, no matter if you also have other channels. 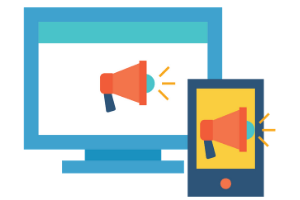 Having a good website with good content will over time create a river of targeted traffic and potential clients. I know that it can seem like a lot and seem a bit scary to build a website on your own and start blogging, if you have never done it before. But luckily it is something anyone can learn. I have seen many people start completely from scratch and been able to build a very successful blog and income online, by doing this. In know it can be tempting to just hire someone to build a website and then start writing random blogs, but this will in my experience not necessarily lead to success. Often I see people just blogging randomly without thinking about how to do it strategically to help their business, and then it is just a waste of time – even big companies often waste time like this. I therefore strongly encourage you to get involved yourself instead of just hiring someone else, and also to learn more about how to blog and do SEO properly. I can of course not show every single step about how to actually build your personal training website, to find the topics to write the posts, and more in just one article. That is why I throughout this article have put links to articles with further information that can give more details. If you want a structured way to learn everything about online marketing and building a successful website with traffic and converting this traffic into clients step-by-step, check out my review of my top recommended learning platform for this called Wealthy Affiliate. It has amazing tools, support, step-by-step training for all levels, and will help you get your website up and running in no time. You can even get your first 10 lessons for free. Having a website with a successful blog is a great way to be able to promote online personal training. There are many other methods that can help you get clients as well, but having a website should in my opinion be used as well no matter what. It is an amazing way to brand yourself, and one of the best ways to get a continuous flow of free targeted traffic from people that are actively looking for what you are offering. I hope this article has given you an idea about why this is an approach worth using, and throughout the article you can find links to further articles that will take you through further steps like learning SEO, learning to blog, learning to cerate a website, creating content, and more. If you want it all in a structured step-by-step format, click the button above to read about my top recommended learning platform. By joining it, you will get access to your first 10 lessons for free, and I will also be there to personally help you with any questions. So now it is over to you – take the next step and start promoting your personal training business today. If you have any comments, any questions, or need any help, do not hesitate to leave a comment below. I would love to hear from you, and will get back to you asap.